Glass vials are normally quite small and made from clear or amber coloured glass and can be either tubular or bottle shape. There are various methods used to close these vials, a screw top which may or may not incorporate a dropper bulb to dispense the contents in very small amounts or a stopper which can be either cork or plastic. The vials can also be sealed with a metal cap where it is vital that the contents are kept sterile. They are often used to store medicines and are widely used in hospitals and by general practitioners. We have all watched our doctor insert his syringe into a vial, withdrawing a measured medicinal substance from the vial before injecting it into his patient. 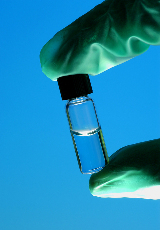 vials are also used extensively in laboratories and are useful when storing small quantities of a liquids, powders or tablets. Professionals from both the medical and scientific world use these vials when collecting samples which have to be sent to a laboratory for analysis. Perfume manufactures also use small vials when promoting a new fragrance. Often they distribute free samples to shops selling their products which are then handed out to prospective customers to encourage them to buy the new fragrance.